Could the Nordic Diet stop obesity? There should be little doubt that Britain has a problem with its’ weight. Current estimates rate the level of obesity at around a quarter of the population. That’s a lot of big people. The traditional British diet, heavy in saturated fats and carbohydrates, added to an ever more sedentary lifestyle would seem to be the cause of the problem. A Mediterranean diet of olive oil, fish, and vegetables has been the cornerstone of ‘healthy eating’ for the last generation, but scientists have noticed that the Scandinavian know the odd thing about healthy eating, too. A broadly Nordic diet shares many of the same characteristics as that of it’s southern neighbours, replacing olive for rapeseed oil, Mediterranean vegetables for brassicas and citrus fruits for cold climate berries. The University of Copenhagen is funding a study into regional Scandinavian food aimed at identifying a canon of ingredients to rival the famed Mediterranean diet in terms of nutrition and taste. brassicas are intrinsically healthy, packed with vitamins and antioxidants. They can taste good. It all seems quite sensible. But does it taste good? 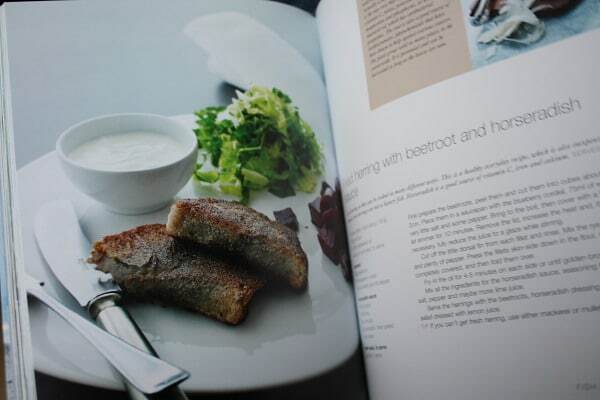 , a further collection of Scandinavian recipes masquerading unconvincingly as a diet book. 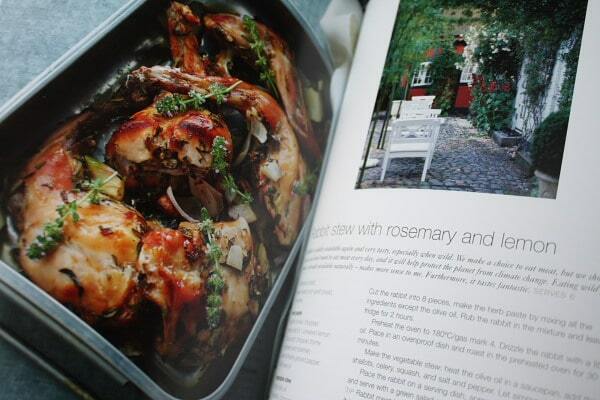 Hahnemann’s cooking is simple Scandinavian, adapted for the foreign market and palate. Recipes are simple and bright, with clean, fresh flavours from recognisable and easily obtained ingredients. Easy Danish smorrebrod, open sandwiches of rye bread topped with herring or salmon, egg, tomato, chervil, dressed with cutting vinegar dressings contrast with a stunning beetroot salad, bright Bishop’s purple, bound with yoghurt, low-fat, naturally, served with a fillet of pollack cured in salt and lemon zest. A kale and chicken salad did little to convince me that I should actually like kale, but the thought of roasting a leg of wild boar is with garlic, rosemary, thyme and red wine, and eating it with roasted Jerusalem artichokes, carrots and potatoes, a lingonberry compote on the side, is reserved for such a time as I can find a wild boar. Funnily enough, Leeds Market is a bit light on wild boar these days. They’ve got plenty of kale, though. Any diet that pushes the consumption of cabbage and Brussel sprouts is going to struggle with it’s image, but the benefits of a Nordic diet are self-evident. Apart from the fairly standard and dull advice about enjoying meals with the family more, sitting down at the table to eat instead of in front of the TV, there’s a lot to like about Hahnemann’s book. The central message is one of balance and care – take time over your food, its selection and preparation, and enjoy eating it. I’m not so sure about the rye bread pizza, though. I think the Italians probably do that better. what interesting Nordic cookbooks, I don't believe that the Mediterranean diet is the only healthy alternative, many traditional cuisines are just as healthy. When a traditional diet changes, often special recipes, ones that were made only for special occasions are eaten daily and this causes a loss of balance. I can't imagine eating roasted wild boar everyday. Well, I've rarely seen a fat Norwegian still living in Norway. I have to say that they eat quite a lot at breakfast (bread with protein rich toppings) and have quite a light bread-based lunch with a larger evening meal which runs counter to all the anti-bread hysteria recently. I think as well that a lot is down to their work-life balance. They're much more likely to sit down to a meal (including breakfast) than we are and are very likely to be going for walks or ski trips in the forest… Not just once a year on a Centerparc's holiday! I'm not sure that leg of wild boar with garlic, rosemary, thyme and red wine, eaten with roasted Jerusalem artichokes, carrots and potatoes is any healthier than a regular British roast dinner! 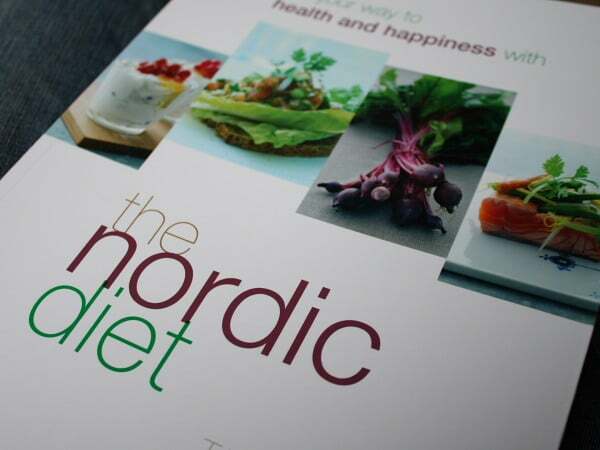 Delicious, certainly and a nice alternative but I think you're right that the book has been shoe-horned into the diet niche purely because of the current media attention (small though it is) on the health aspects of the Scandinavian diet. Does look good though. Which of her two books appeals most/ would you recommend, ignoring the diet aspects of either? How did I live in Sweden and not experience roasted wild boar? Shame on me! I noticed that Swedes seem to get a lot more incidental exercise in their days than I witness here in Australia which I am sure has a lot to do with it too. Kayey – that wild boar dish probably is a LOT healthier than a British roast dinner. Wild boar is far leaner and lower in cholesterol than our pork, and it's delicious. Using rapeseed oil to roast the veg in also helps on the 'health' front. I haven't seen the first book, so I can't compare it to this, but I must admit to being quite taken with this one. I immediately thought it was just another stupid faddy diet book, but there's some proper substance here, and some great photography. To be fair, the 'diet' bit is over and done in the first chapter and the rest is recipes. JAD – I'll try that, just tell me how to pronounce it next time we see you. I think *any* diet that stays away from processed foods and makes most meals from scratch will reduce the incident of obesity regardless of whether it's Norwegian, Mediterranean, Indian, Korean, Ethiopian or any other cuisine. Keeping highly-processed foods out of your pantry such as high fructose corn syrup (which none of our ancestors ate 300 years ago), will work wonders for your waistline as well. I think any diet that introduces a wide variety of greens is a good thing. I admit, we are still heavy meat-eaters; there's always a little bit of some creature in our meals, mostly because I'm not good with preparing seafood. Is it too late for another resolution…? But I agree with making sure the portions of vegetables are bountiful with each meal. The Nordic diet has tons of fiber and lean protein. The Toro brand dried mixes that I sell from Norway are made with sun dried vegetables so even that processed mix has a bit more nutrition to it- and tastes like fresh! I havent had the rye bread pizza- per say- but we do eat melted cheese on wasa or other hardtack, yum! Great info, Anybook that promotes eating healthier is a good choice. I so agree with this post. The problem is that most Brits lack the self confidence to cook. sure we watch all the shows but when it comes to daily life it seems that most Brits just feel they cant do it. As for fish, my most favourite food, I could live on it! Its very much a case of, if its not breaded or battered then we just cant deal with it. Fresh fish, veg and fruit, mmmm and healthy too. In addition to diet, lifestyle is pretty important. I think that many people is Nordic countries are more physically active that other Western nations. Just an extra 30 minutes per week can make a big difference over 5 years. I would like to try the wild boar though! Rye bread Pizza? That's not rocking my world, man!! Mmm! I worked in a factory in Norway for about a year in 1980 so my experience may be irrelevant and out of date but I thought the diet was fairly unimpressive; because of the very short growing season, fresh vegetables seemed to be expensive and much of the meat consumed seemed to be processed in one form or another. Fish and reindeer meat were both eaten quite a lot and are obviously lean and healthy proteins but I would have thought the real reason that Scandinavians are so healthy is down to the huge popularity of out door pursuits such as skiing and walking. At the factory that I worked in, the annual ski fest attracted a thousand or more people from toddlers to eighty year olds; all on skis and all having a great time – you won't see that in Britain. Possibly the best three-bean chilli in the world?